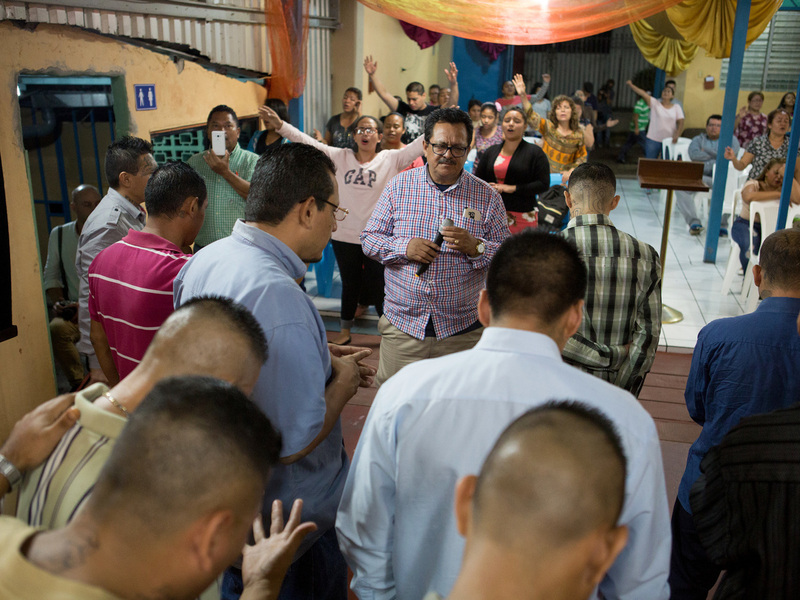 For Some Gang Members In El Salvador, The Evangelical Church Offers A Way Out "Our message is that [the gang members] should understand there is a life outside of the gang," says evangelical pastor Nelson Moz. "That they can make it, with the help of God." 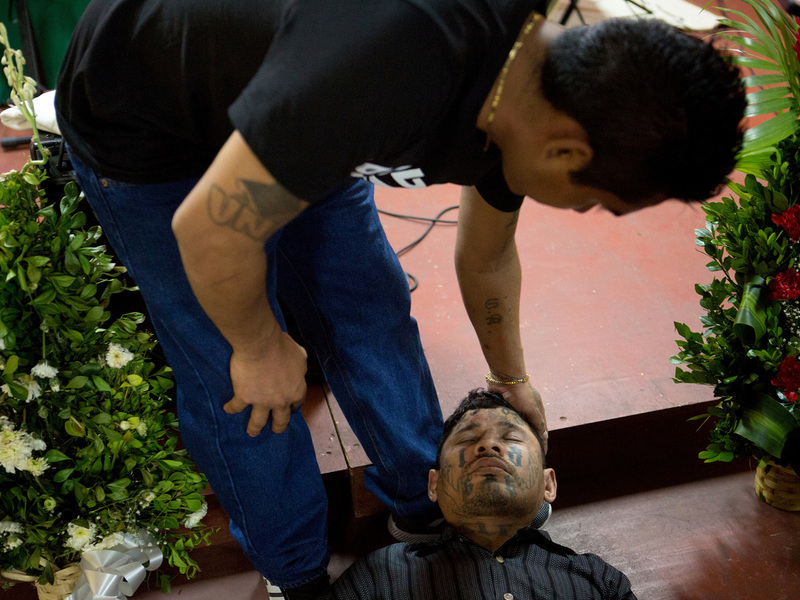 Carlos Montano, an ex-gang member, faints during prayer at San Salvador's Eben-ezer church. 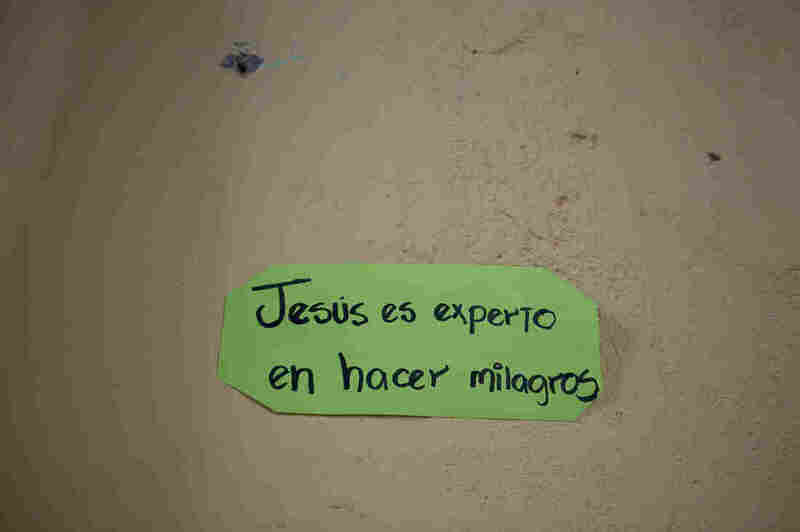 A sign reading "Jesus is an expert in making miracles" hangs a wall of the Eben-ezer church in a gang-controlled neighborhood in San Salvador. Inside the Eben-ezer Baptist church, around 10 former gang members, easily identifiable by their head-to-toe tattoos, sing along and clap fervently to songs praising Jesus. The church's newest member is 24-year-old José Rolando Arévalo. He has a tattoo on his chin that confirms his former allegiance to the Barrio 18 gang, which he joined when he was 14, after his brother was killed by a rival gang. He has been out of prison for just 10 days. Like many former gang members, he embraced evangelical Christianity when a pastor approached him in jail. "He started talking to me about my life. About everything that had happened, in the gang and with my family," Arévalo says. The Rev. Nelson Moz, churchgoers and ex-gang members pray together at Eben-ezer in San Salvador. The pastor also started talking about God and how the evangelical church would embrace him. Arévalo says his heart was touched. For the first time, someone had talked to him about his life and the decisions he had made in a way that got through to him. He has attended church three times since his release from prison and has left the gang. During the service, a pastor talks about the gangs, known in El Salvador as pandillas. He tells the congregation that in prison, God leaves one naked and opens the doors for new beginnings. He says God is always faithful, even when others aren't. He prays for gang members to leave behind a life of violence and join the church. "The God we preach is one of opportunity," another pastor, the Rev. Nelson Moz, who has led Eben-ezer for 21 years, says after the service. "Our message is that [the gang members] should understand there is a life outside of the gang. That they can make it, with the help of God." It is this emphasis on personal transformation that makes El Salvador's gang members embrace evangelicalism, says José Miguel Cruz, director of research at Florida International University's Kimberly Green Latin American and Caribbean Center, who has studied the relationship between the two. In Cruz's research, more than half of the Salvadoran gang members he surveyed identify as evangelicals and attend church services an average of 15 times a month. In contrast, just 17 percent of gang members identify as Catholic. "They feel the evangelicals are more welcoming despite their criminal past. And they feel embraced in these conversions by the [evangelical] church," he says. This phenomenon has coincided with the growth of evangelical Christianity in El Salvador and other Latin American countries. 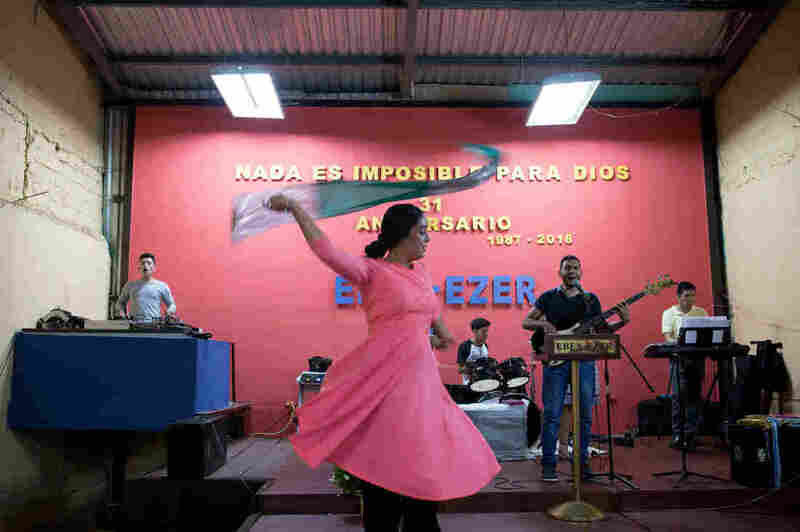 About half of Salvadorans identify as Roman Catholic and 40 percent as evangelical Christian. Becoming a devoted member of an evangelical church at a young age is the only way many adolescent boys are able to avoid being roped into a gang, Cruz says. And it's also the only way for them to get out of a gang if they're in it, short of leaving the country. A congregation member dances during a service at Eben-ezer. A former gang member highlights a Bible passage during a service at Eben-ezer. "You join the gang. You join [the] evangelical church. Or you leave El Salvador and you migrate," he says. "So those are sort of the three options that young people in these communities controlled by criminal groups have." 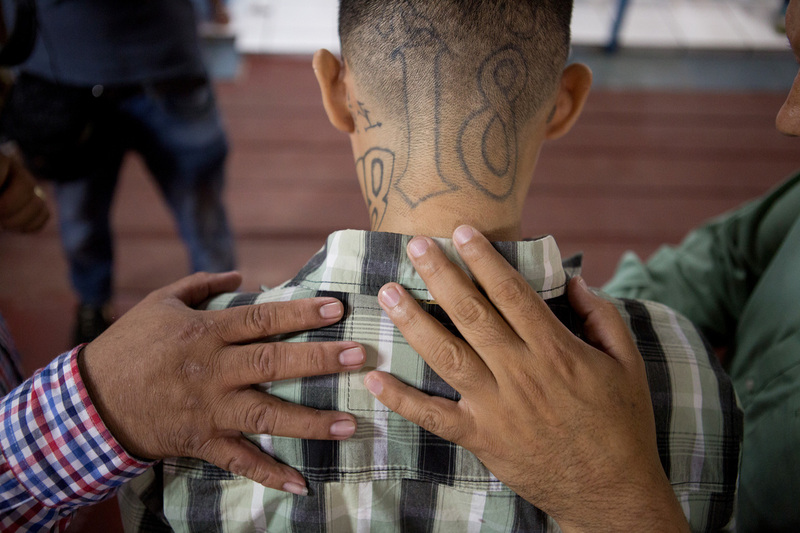 Gangs also feel protected to some extent by the evangelical churches, according to Carlos Martínez, a journalist who covers gangs for the Salvadoran news outlet El Faro. The churches were founded in the same poor communities that gangs control. "They are the community. And they have learned to live alongside the gang members, who they have known since they were kids. Because at the end of the day, it's their sons, husbands, boyfriends, parents and nephews," he says. For Carlos Montano, a gang member for 22 years, joining the church was a matter of life and death. 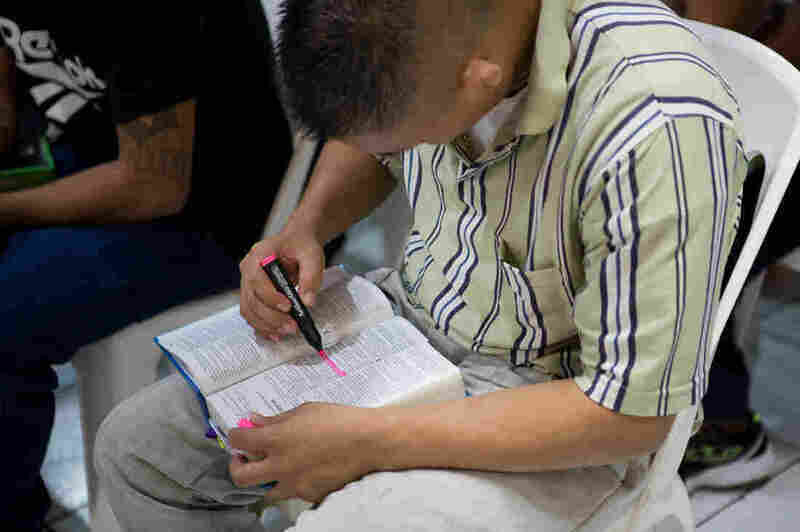 José Rolando Arévalo, a 24-year-old ex-gang member, prays at Eben-ezer church. His head is tattooed with the number 18, a reference to his affiliation with the Barrio 18 gang. Tattoos cover his face. The number 18 is tattooed 18 times on his body, a reference to his past allegiance to the Barrio 18 gang. During his years in the gang, he says, he kidnapped and robbed, and he raped women. He was sentenced to prison for those crimes, and thanks to an evangelical pastor there, he found God. That was nine months ago. Now, he says, God knows about his past and has forgiven him. If he had stayed active in the gang he would very likely have been killed, he says. Now that's he is out, being a casual churchgoer isn't an option. The gangs check up on former members to see how often they attend services and whether they are drinking or smoking on the side. They want to make sure former members don't engage in criminal activity on the side that could ever pose a threat. "I'm a Christian. And the gang respects that," Montano says. "But if I fail as a Christian, they will kill me."